I've got the stock Rev8s that come on a shelf. I'm looking for different mounting options. I would like to get the speakers farther back or maybe on the outside of the tower to help the passengers. Wondering if I can still use the shelfs to do this? Seems I could switch the shelf to the opposite side and flip the speaker it should work and be farther back? But, it would probably be a worse headbanger! Maybe the shelf on the outside of tower or can the speakers be direct mounted on outside of tower? Without going mickey mouse ears (ala @Slurpee ) I think the best case is to either buy swivel mounts and mount directly to the G3 rear hoop, or buy the WS dual mounts and only use the high position (which will put the speakers up in the corner of the legs and hoop). Mounting outside of the tower seems like it'd interfere with boards/racks, no? Mickey mouse ears is definitely the best solution from an audio isolation perspective, but then you have to deal with doing something about the bimini (mods required). If you do get the bimini modded, then not only are the speakers higher, they are also above the bimini, which creates another audio break. Here’s my thread on the subject. 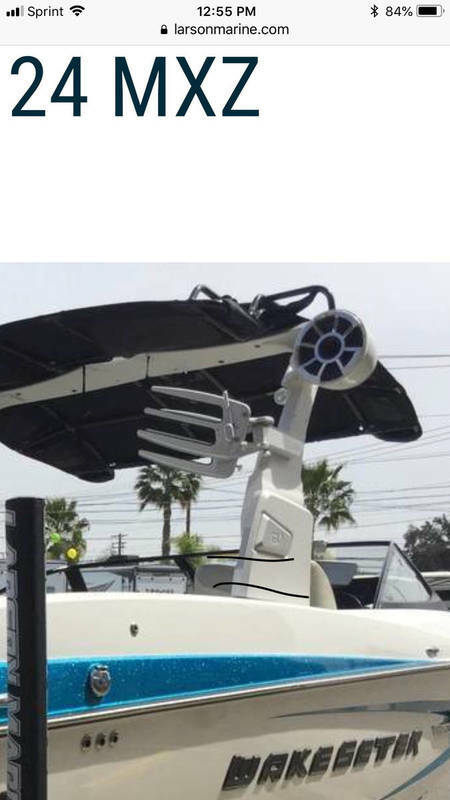 Moving your LOUD tower speakers around in the boat under the bimini won’t do a thing for reducing the noise in the cabin at any meaningful volume for behind the boat. You have to put them above the Bimini or at the back of the boat behind the cabin somewhere somehow. These seem like they’re directly bolted on? If wakeboards cleared that it would be an interesting compromise. I need the bimini between us and the towers to make sound manageable. But that there does remove the head knockers. I couldn’t do it though because I’d hit my lift cables and mess em up. weird and interesting. Would mess up being able to fold the tower down too, right? If that's important and I realize it isn't important for many people.